I came across this recipe, and the mere fact which caught my eye, was that even though the cake is baked, it does not require any batter mixing. Since I had all the necessary ingredients on hand, and knowing that Rosh Hashanah is just around the corner, thus perfect time to whip up a quick apple dessert, so I gave it a try. I was quite skeptical about shaving all the butter on top of the dry ingredients, but gave it a try nonetheless. This recipe is so simple, thus perfect for even the beginner baker. 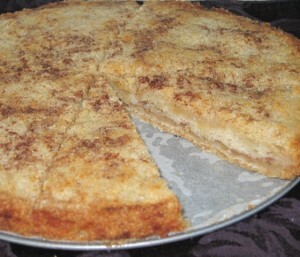 The finished product is not heavy, not too sweet, and may be served warm or cold, plain or with choice of topping. 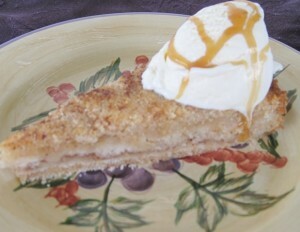 I served it warm with a scoop of ice cream, drizzled with caramel sauce, and next day a we had it cold, topped off with whipped cream. The first day it was slightly crunchy, but by the next day the moisture from the apples penetrated all the layers more evenly, and smoothed out the texture. Shred the apples on a large eye shredder. I used a 10-inch Springform Cake Pan, placed it on top of parchment paper, traced around the bottom of the form, and cut out the circle. 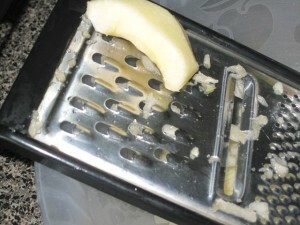 Shavings of butter, by grating frozen butter on the same large eye grater as apples. 3/4 cup ( 1 1/2 stick) frozen butter). Piece of parchment or waxed paper. Wash, peel, and core, apples. Shred apples on a large eye grater, mix in cinnamon, and set aside. 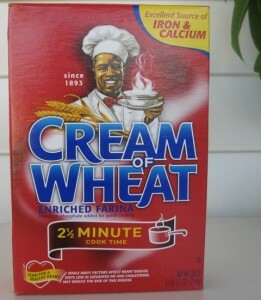 In a large bowl, mix flour, cream of wheat, sugar, and baking powder. 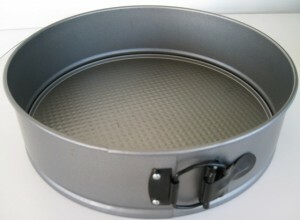 Cut out a circle from a parchment paper, large enough to cover the bottom of the cake pan. Smudge some butter on the bottom of the baking pan (to hold down the paper). Lay the parchment paper circle on the bottom of the form. Grease well the paper bottom, and the sides of the pan. Divide the flour mixture into three equal portions ( 1 cup each). Sprinkle evenly 1 cup of flour mixture on the papered bottom cake pan. Divide apples in two equal portions, and spread one portion on top of the dry ingredients (I dropped spoonfuls of apples strategically all over the dry ingredients, then with a spoon smoothed them out carefully as not to disturb the dry bottom layer too much) . 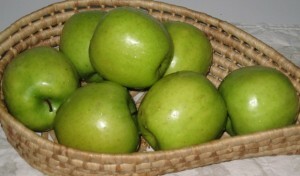 Cover apples with another cup of dry ingredients. Spread the remaining apples over this layer. 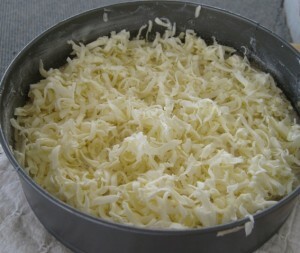 Cover with remaining flour mixture. Cover this top layer with shavings of butter, by grating frozen butter on the same large eye grater as apples. Preheat over to 350 degrees F, and bake on the middle rack, for 60 minutes. Don't panic if you notice that there is a pool of melted butter on the top of your cake. During the course of baking, the butter will be absorbed by the dry ingredients, combined with the apples juices, which will saturate the consecutive layers. Some butter will drip out of the baking pan, thus to prevent messing up your oven, place a larger pan (I use a pizza pan) under the cake pan, to catch the dripping butter and apple juices. During the last 10 minutes of baking, sprinkle the top of the cake with chopped pecans, and continue baking. Once done, remove from the oven onto a cooling rack, and let it cool for 10 minutes, then release pan spring and remove sides. If you choose to serve it warm, use a serrated knife for easier slicing. 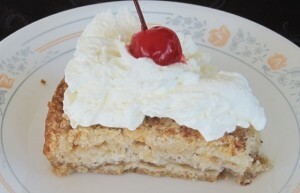 Hi…my wife want to try this Apple dessert recipe, but I can’t find Springform Cake Pan. Can you show me where to buy it? I am glad your wife will try the recipe. Please click on the highlighted word “springform pan”, since it has a link, which will show you where you can find these type of pans. Also, as a reference, whenever you see highlighted words in my posts, if you click on them it will take you to another site for more information. I am wondering about the quantity of butter. It states 11/2 cup butter and in bracket it says 1 1/2 sticks. My understanding is that 1 stick is 1/2 cup of butter (4 sticks in a pkg equalling 2 cups butter). Thus it should be 3/4 cup butter or 3 sticks. I made it with 3/4 cup butter and it was good! Next time I will also add more apples to make it more perfect. My apologies for the typo…I try to proof read these posts, but apparently sometimes I am not seeing what I am actually reading. You are absolutely correct about the butter. IT SHOULD HAVE SAID 3/4 CUP = 1.5 STICKS). You are a wonderful baker to spot that, and I truly appreciate it being brought to my attention. I am so glad to hear that you enjoyed this recipe and plan to bake it again with more apples. My taste buds are dancing in my mouth, just thinking about it….yum! Sounds like a winner! I am very happy to hear that Vera not only tried this recipe, but also recommended it to her friends. She’s awesome! Thank you for sharing your comment with us, and please stop by more often to check out what’s new.